If you caught Steve Wynn on FoxNews Sunday with Chris Wallace today, perhaps like me, you thought of the image above. Mr. Wynn is right! Barack Obama’s entire domestic agenda is based on a false premise. In fact, in all that Obama is pushing his fatal flaw is that he has put the cart before the horse. 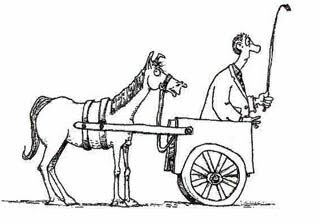 The cart being comprised of health care reform, economic stimulus, cap-and-trade, tax increases, wealth redistribution, ….etc….etc… And the horse being job creation. The false premise being that you cannot redistribute what you don’t have. For the 15.1 million Americans who are jobless, giving them health care reform that they cannot afford is meaningless. Solving the problems of the universe through cap-and-trade by raising utility bills for those already on government assistance will only increase the amount needed for such entitlements. In fact without the ability to provide for ourselves, life itself is pretty much meaningless. Last week 35,000 Americans lined the streets of Detroit hoping for a one time handout. If the government provides this one time handout, what will those people do next month? When the government provides a one time stimulus of $600 (or $250), how far does that go? Mr. Wynn is right in saying that without job creation there is nothing. Obama is creating a Black Hole wherein an ever shrinking workforce will be forced to pay an ever increasing amount of taxes to support the ever expanding base of unemployed. And it won’t end until the government listens to people like Mr. Wynn and starts to implement tax policies that promote incentives for businesses to expand and hire. The only way this is going to happen in a timely manner is for the priorities to change. Left and Right must join together as one, and demand that Congress change its priorities. Cap-and-trade, health care reform, so called economic stimulus, tax increases, and wealth redistribution need to be tabled. The number one priority today is job creation and the way to do it is through tax policies. I live my life one day at a time. As a business owner myself, my revenues are directly affected by the economic condition of my customers. If my customers can’t afford my services, then my business suffers, and those who depend on me suffer. This is something that can’t wait. We can’t wait 4 years for Obama to impose his agenda while people are suffering daily. The uncertainty this administration has imposed on the business community is so thick you can cut it with a knife. We need action today. “Hey Congress! The horse goes in front of the cart.” Jobs, jobs, jobs, and then you can talk to us about your utopian fantasies. You can find my response on 'Obamanomics: The Slavery of Past Savings'. Oh! and you may want to listen to Dr. Richard Wolff's -video. Thanks for all you do to advance the cause of 'JUSTICE' – 'Economic Justice' that is. PSS. Its not about Jobs, Jobs, Jobs,.. It is about advancing “Capital Ownership” or what we at the 'Center for Economic and Social Justice' (CESJ.org)refer to as “Expanded Capital Ownership”. How else in the realm of Natural Law can you build, repair or defend that which you do not own? Yes Sir you are correct. I got carried away in using the rhetoric of the current administration against them to make the point that they are not even doing what they said they would. It is about advancing “Capital Ownership” with governments only role being to offer interest free loans. I am reading and viewing your references from the AIP website. Thanks.